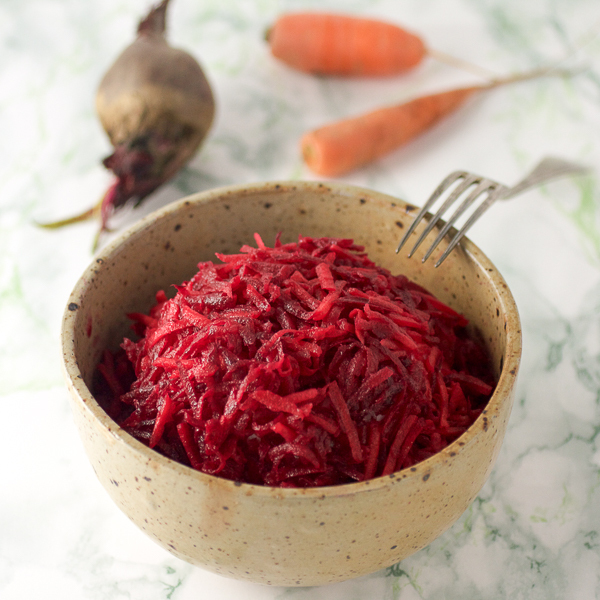 Grated beet and carrot salad: the healthiest meal you’ll have all week. Generally I have some idea about the post before writing it. I’m not at the level of David Lebovitz who has at least 50 unfinished posts somewhere on his computer, but I make do. If an idea strikes me, a story I must share with you, I jot down a few notes. Then I find a way to incorporate it. But today, no such luck. What can I say about beets and carrots that hasn’t been already said? Especially when I don’t have a story that in some way connects me with either one of these vegetables. If you asked me about ears, I’d have at least a few. This one time my brother returned from skiing with his friends. His ear was frostbitten, red, and big. It hurt to look at. Dad told him the ear would fall off by nightfall. It didn’t. But it almost did. Another time my cousin whose ears stuck out asked dad to help him. Dad told him to tape his ears before sleep each night. He was joking again. Even after incessant night taping, my cousin’s ears are as protruding as ever. Then there are my ears. Regular people take their toddlers to a jewelry store and get the piercing over with. No memory, no trauma. My parents, medical professionals, decided they could do it themselves. They chased me around the house with a sterilized needle. Then they caught me and pierced my ears. Crookedly. So there go the ears. But carrots? Beets? Not much to say there, except they’re healthy to eat. Beets, for one, have these phytonutrients. If it’s been a while since your last biology class, as it has for me, wiki says these substances found in plants are beneficial for health and disease prevention. They help fight environmental stress. And have shown promise in cancer studies. A word of warning: your number 1 and 2 may turn a purplish for a while after beet consumption. If number 1 is very purple, you may have trouble with iron levels. Want a fun fact? They’re a great aphrodisiac. Just consume them in raw or close to raw condition. But carrots, carrots are so cool they have a birthday. It’s April 4 if you’re interested. In the US, people eat on average 11 pounds of carrots each year. They come in different colors, but you and I generally see them in their orange variety. A few centuries ago they ranged from white to red. Unlike beets, nutritional value of carrots improves with steaming. 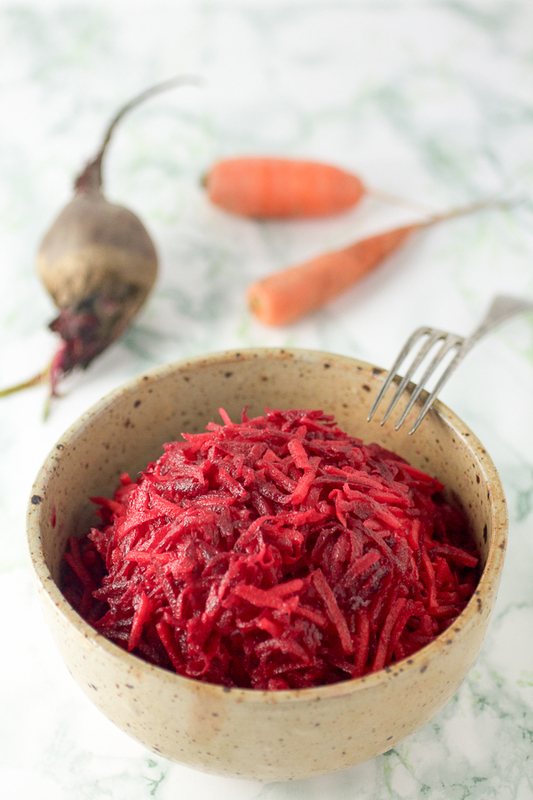 Like beets, carrots prevent macular degeneration (eye disease), slow down aging, and help with blood pressure. And you can read even more about carrot health benefits here. But whatever you do, don’t eat baby carrots. These aren’t babies at all. Instead, they’re carrots that did not pass the beauty test and have been cut down to “baby” size. All forgivable offenses. Unfortunately they’ve also been doused in chlorine water to stay fresh at the store. So skip the babies, and instead make your own. 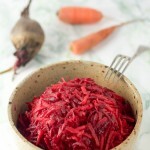 Or even better, make this beet and carrot salad. P.S. For more salad ideas check out the apple and carrot salad, the classic chicken salad as well as the chockfull of vitamins sour cabbage salad. Peel and wash beet and carrots. Grate them. Mix salt, oil, vinegar, and lemon juice separately. Add to the salad. Mix really well. (Optional) Leave in the fridge for a couple of hours. Leaving the salad to combine in the fridge will improve the taste. Be careful with the beet, the color it spews will color your clothes, hands, and counters. Do you have to cook the beet? Hi Maria! No, the beet is fresh. Any vinegar is fine. White wine vinegar. Regular vinegar. Apple cider vinegar. Even skipping the vinegar and using only lemon juice is fine too.